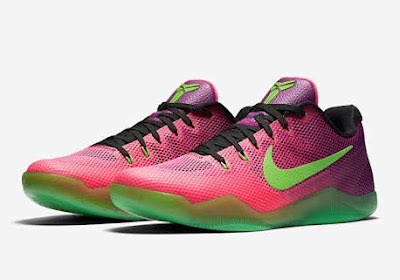 The OG colorway of the Mambacurial for the Nike Kobe 11 is now available. If you are a regular reader of Analykix, then you already know that there are 2 versions of Mambacurial. This one has the OG colorway of pink and green which drew inspiration from the mercurial soccer cleat. Also, this colorway of Kobe 11 is made up of engineered mesh which means that the other Mambacurial (blue) will have the Flyknit version for the upper. If you love collecting the Mambacurials, then they are now available for Php 8095 at Nike Stadium.